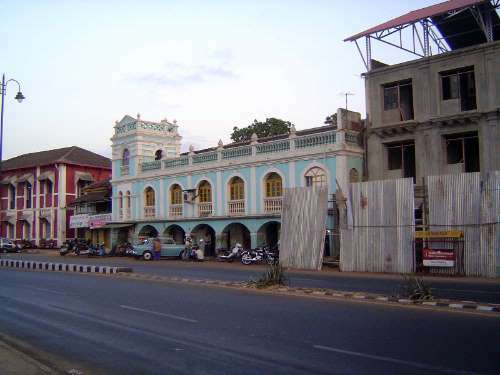 Panaji ("Panjim" until the end of Portuguese rule in 1961) became the capital of Portuguese India in 1843; since 1759, however, it had been the viceroy's residence. 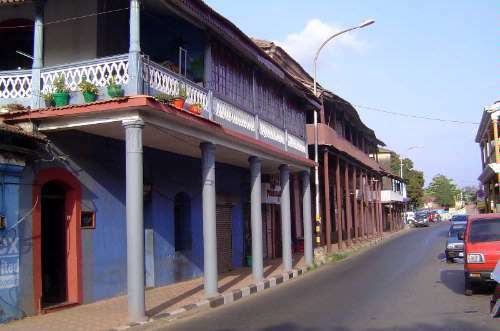 Old Goa was gradually abandoned, its stones frequently cannibalized for use in the new city, which was closer to the sea and healthier than the once glorious old capital, left to decay. 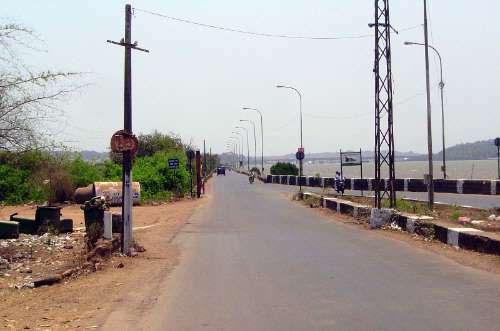 Looking west over the causeway and toward the sea. 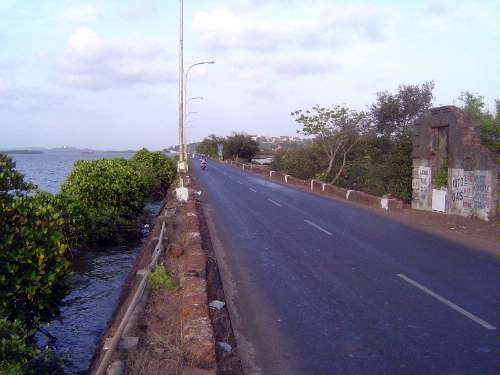 In the distance, a new bridge crosses the Mandovi River. 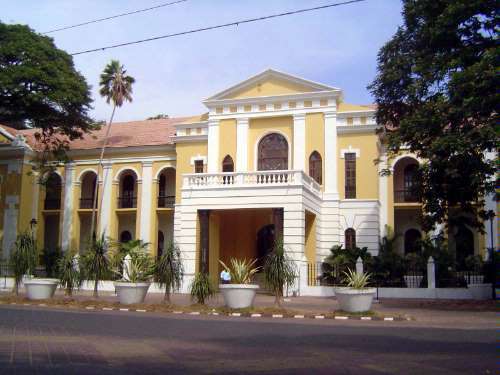 The Idalcao Palace. The name is a corruption of Adil Khan, the sultan of Bijapur who lost Goa to Afonso Albuquerque in 1510. The name Adil Khan morphed to Idalcan, then to Idalcao. 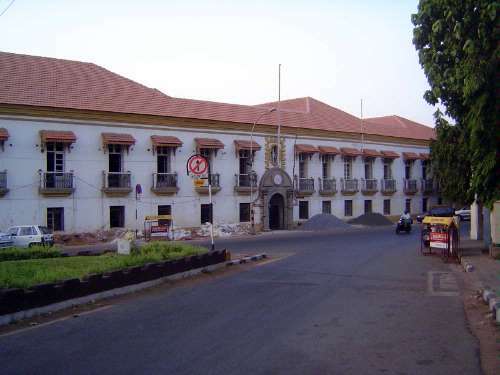 His palace morphed to a Portuguese fortress, then in 1843 to the Viceroy's Residence, then in 1961 to the Secretariat. In 2009, it was morphing into something yet again. 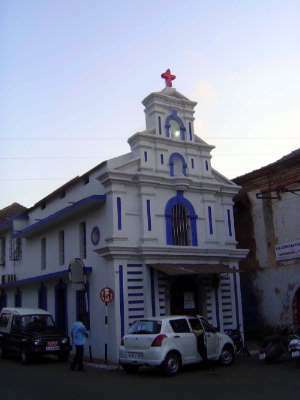 A few blocks inland, and on a hill from which mariners could readily spy it, the Church of the Immaculate Conception was opened in 1541--at the height of Goa's glory--but rebuilt in 1619. The facade was rebuilt yet again to make way for the great bell added in 1871. 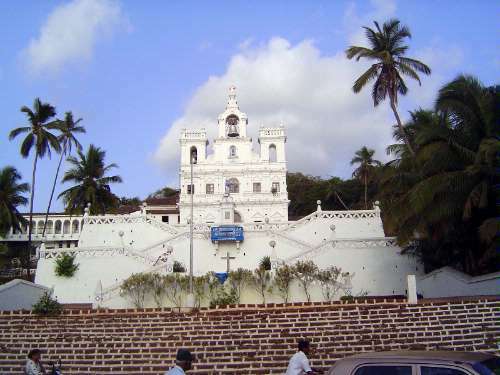 That bell wasn't new; it had been in the Augustinian Church in Old Goa, and like so much there was recycled to Panaji. The steps were added at the same time. 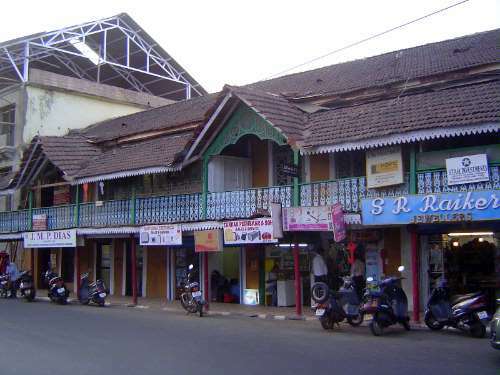 The most interesting part of Panaji may be its eastern edge, bounded by the Ourem River. This was swampy until reclaimed during the term in the early 1850s of Governor José Joaquim Januario Lapa, Baron and afterwards Viscount of Villa Nova de Ourem. Both the river and street carry his name. The neighborhood is called Sao Thome, after this tiny church, built in 1849. The city desperately needs (well, OK, it's not panic stations, but it would be helpful if the city posted)information signs so visitors knew what they were looking at. 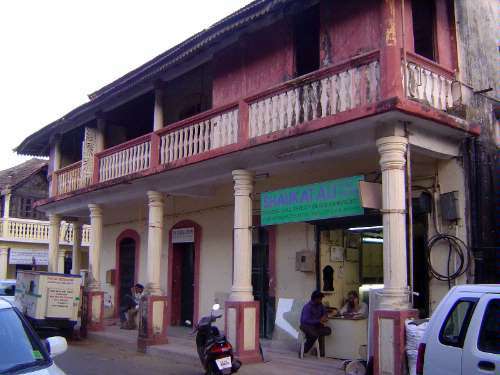 There's plenty of information available for Old Goa, but little for Panaji. 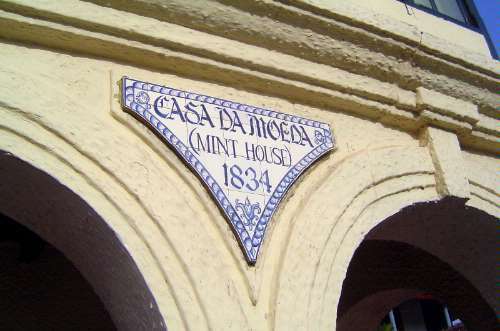 One exception is this old house, Casa Moeda, converted to government use in 1834. That little triangular sign between the last two arches is just the thing. Thank you! It turns out that Goa didn't make good coins. 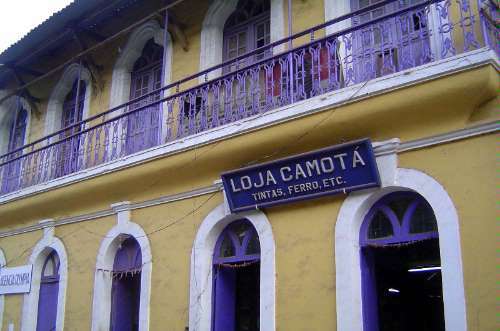 By about 1870, the Portuguese contracted with British India and from that time forward Goa's coins were presumably minted in Bombay. 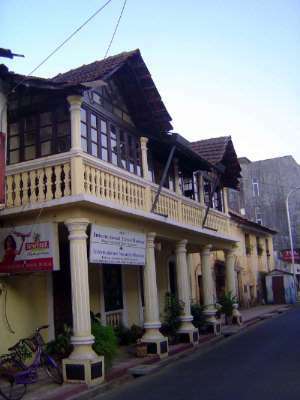 Still in San Thome, a typical Goan house. 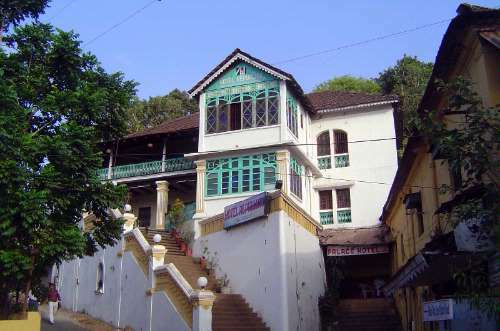 Gerard da Cunha (Houses of Goa, 1999, p. 103) says that the Goan house, "is distinguised by its balcão or sopo." He writes that the balcony "functioned as a transitionary space between the public and private domains of the house." Other writers go further. 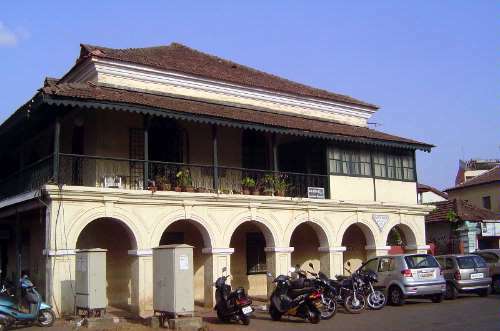 Helder Carita (Palaces of Goa, 1997, p. 166) links the balcony to caste: "In Brahmin and Chardo [=kshatriya] houses, members of lower classes were not allowed to enter.... The porch of the Indo-Portuguese house resolved this problem perfectly, as it created a room outside the house which was treated as a protective ante-chamber to the interior." 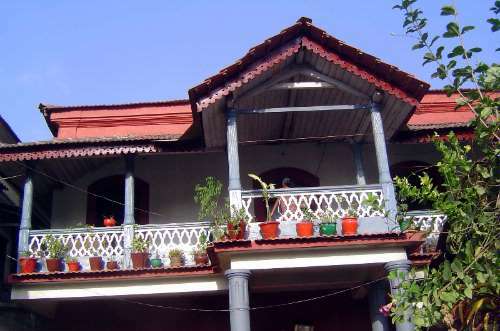 The balcony apparently became a standard feature of Goan houses in the 19th century; in this case, it's been double-stacked. 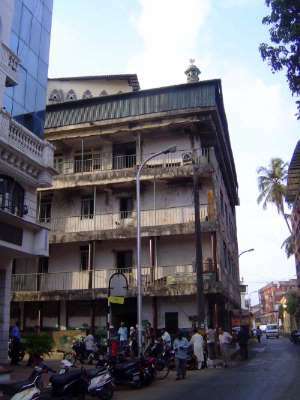 In this case, an old house has become a hotel. 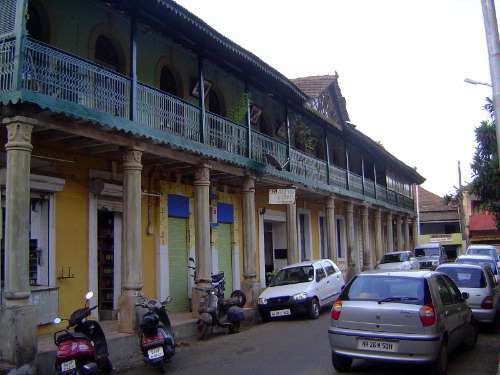 The commercial buildings of San Thome are all double-storied with an upper gallery. The late vintage is suggested by the use of iron columns. The use of white paint as the dominant color is restricted to churches. 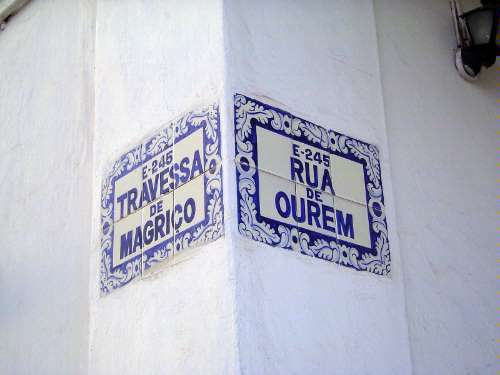 Signs 50 years ago might have been in Portuguese; now they're mostly in English. Columns obey no classical orders and tend to the flamboyant. Even in the 19th century, ironwork was used in balustrades. Mostly, it came from British India. 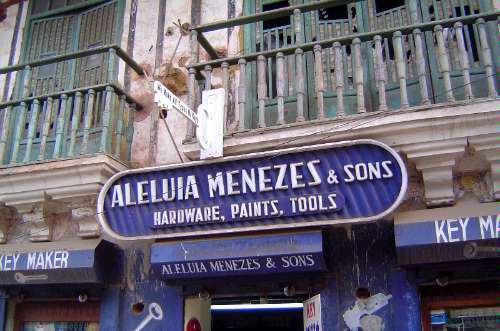 Even when the signs are English, the shop names often hint of the Portuguese past. 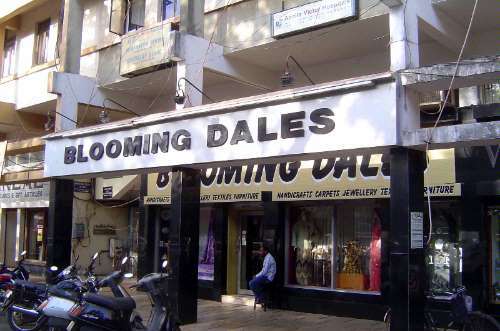 There is a scattering of official buildings, but by the standards of British India everything is very modest. 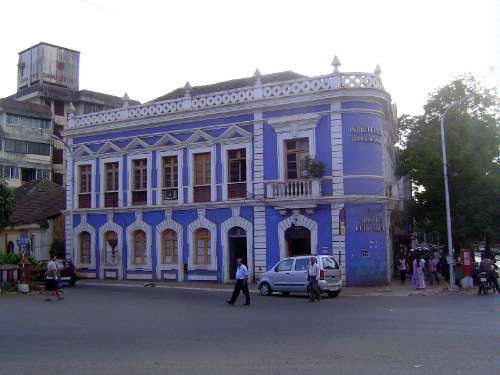 Here a building overlooks the Mandovi and its Rua de Boa Vista. The traffic is intense enough to make a stroll not so very boa. About as grand as it gets. No signs to help the poor visitor. 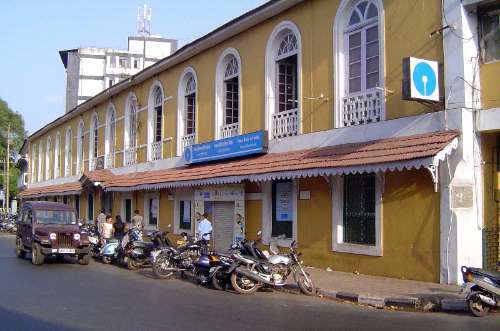 A part of the high court that thoughtfully includes a branch of the State Bank of India. A theater, well cared for. The Municipal Gardens, formerly the Garcia da Orta Garden. 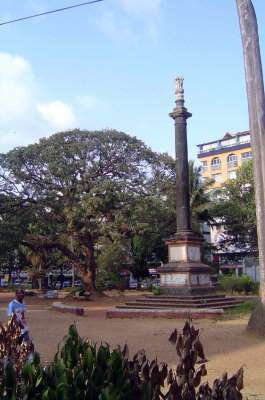 The column proper, dragged down here from the Convent of San Domingos in Old Goa, was erected in 1898 to mark the 400th anniversary of Vasco da Gama's arrival in India. 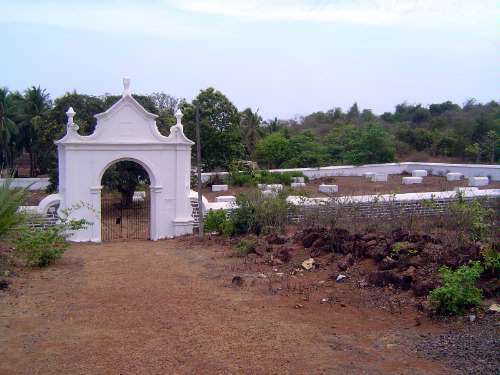 Vasco was taken down after the departure of the British and an Ashoka capital erected in his place. In the blocks around the park there is a 20th century city, some buildings classical, some modern. The colors can be bold. The city mosque, strikingly pedestrian. 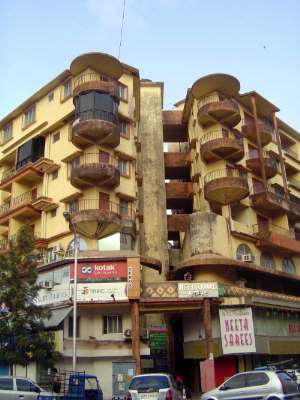 An apartment building, perhaps from the 1950's? 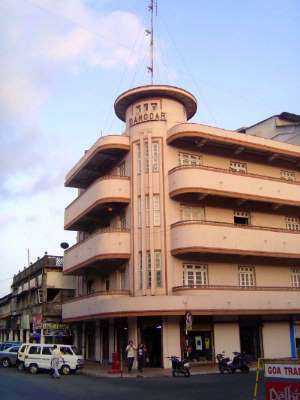 Another example of tropical-modern Art Deco concrete. 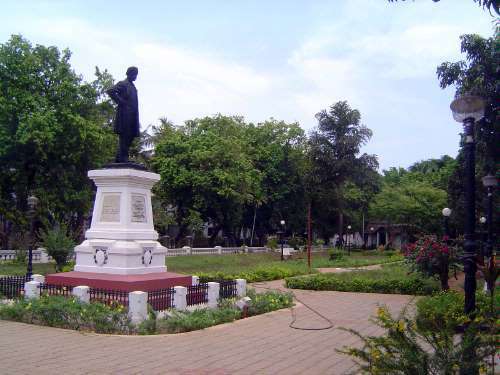 A riverside park holds this monument to Francisco Luis Gomes, who managed to walk the fine line of serving as Goa's long-time member of the Portuguese parliament while also advocating the departure of India's colonial masters, British as well as Portuguese. 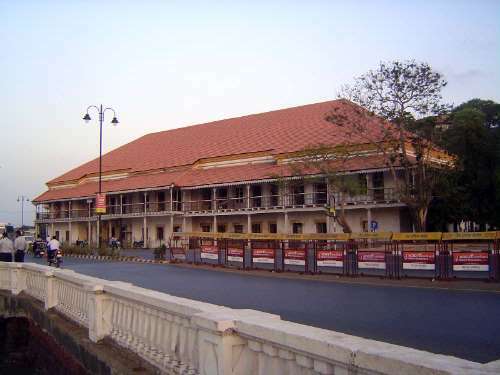 He must have been very adroit, because his statue was erected in 1929, while the Portuguese still ruled Goa. He was able, it seems, to tell them to go away so skillfully that they did not object to honoring the centenary of his birth. 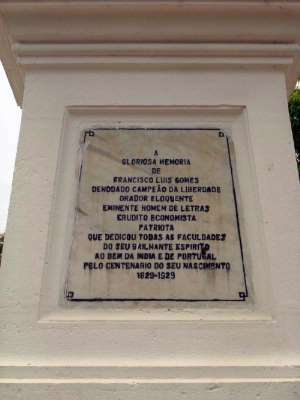 The one obvious omission from the accolades was Gomes' membership of the Cortes or parliament in Lisbon. 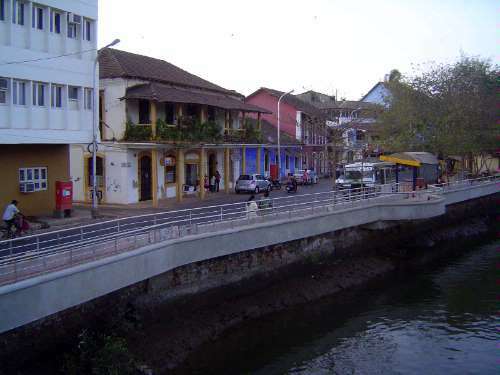 Between 1779 and 1813, the British stationed thousands of troops of Goa to resist a possible French attack. They left this cemetery, with monotonous, above-ground tombs, most now painted to illegibility. 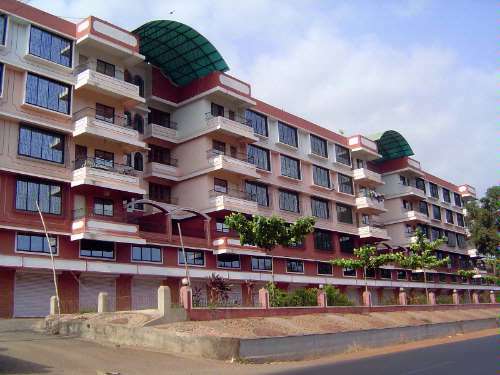 There isn't much in the neighborhood that would strike a house-buyer today as new, but here's an exception, an apartment block just east of Old Goa. 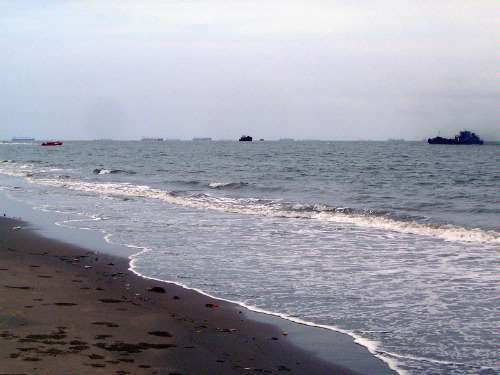 The sea is still present, of course, with a surprising number of ships at anchor. Good sign? Probably not. Probably more a sign of inadequate port facilities at nearby Vasco da Gama. 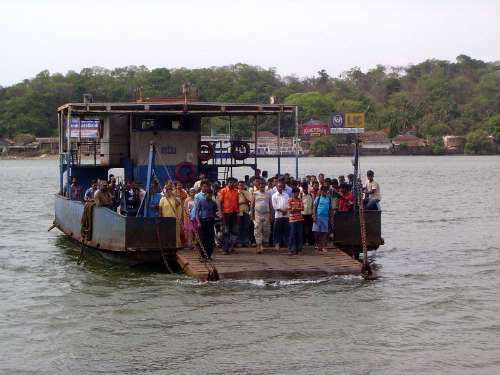 Despite the new bridge across the Mandovi, old ferries stay busy. 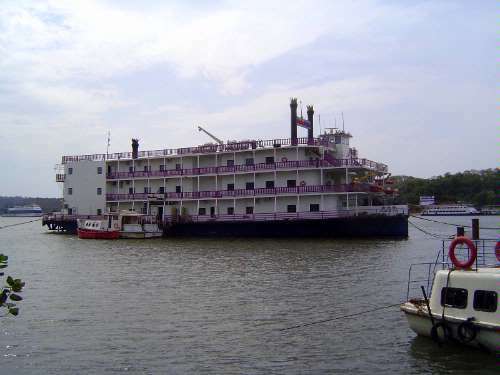 Tourists use the river, too, not as a highway but as a place for floating casinos like this Mississippi-style stern wheeler.